I tend to be skeptical when persons raise concerns about “national security.” Too often that phrase is used to either intrude illegitimately into areas that are nobody’s business or to hide official misconduct or, perhaps more often, official acts of stupid. Nevertheless, “national security” is a real thing and ignoring or weakening it costs blood and treasure, as when President George the Worst ignored warnings that Osama Bin Laden was determined to attack the U. S.
First, his foreign policy of “America first” has called into question our commitment to our allies and the international framework and norms that have kept us safe and prosperous for 70 years. In turn, the American institutions and individuals who must execute this policy are undermined. Second, some of his actions and utterances are so far outside the bounds of responsible presidential conduct that many professionals who serve in the national security agencies lack confidence in him as commander-in-chief. Much damage has been done and whether it can be repaired, and if so how, is not clear. Do please follow the link. Thom discusses evangelism and evangelical causes and the danger thereof when they become political. He starts by somewhat awkwardly establishing a premise the Communism was an evangelical movement, that, one that wished to convince persons to follow it to the exclusion of others, and moves on to argue that evangelical movements can lead to crusades. It’s not as polished as his usual presentations, but I think it’s well worth a listen. Instead of getting rid of the planet’s horrifying nuclear arsenal, humankind’s only winning strategy for avoiding Armageddon these last 72 years was not having nuclear launch codes in the hands of people like North Korea’s dangerous and despotic Kim Jong Un or a hotheaded, impulsive, and unconventional American president like Donald Trump. The last week has revealed the utter folly of that notion. 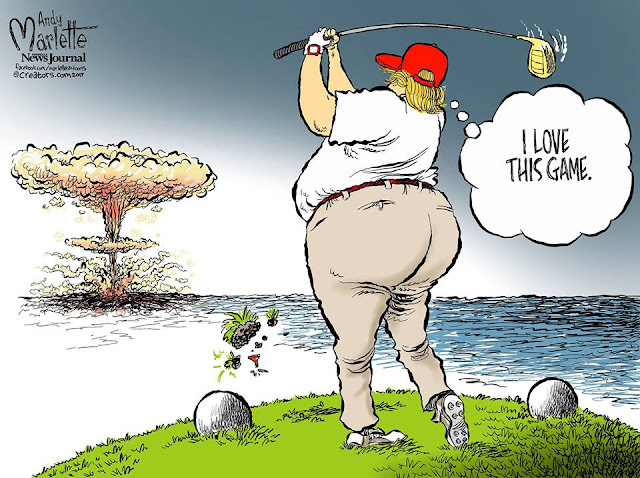 The good news is that the experts still believe, despite the insane rhetoric and threats from both sides, that a nuclear war involving the United States, North Korea, and assorted allies is highly unlikely. In that sense, it’s a little like comedian Steven Wright’s joke about his plan to live forever: so far, so good. Thom discusses “little wars” as a political tactic. Farron describes how members of the Trump administration are trying to clean up the mess after the Trumpler-in-Chief’s warmongering rhetoric about North Korea. Given Donald Trump’s disdain for diplomacy, Tracey Rubin sees more blood in the sand (and the forests, and the cities, and the seas). “If you don’t fund the State Department fully, then I need to buy more ammunition,” said the general, who was then head of U.S. Central Command. Mattis recognized that skilled diplomacy is required to prevent wars or cement military victories. Meantime, Secretary of State Rex Tillerson conducts diplomacy as if he were still the god-head of Exxon Mobil, consulting only a few aides while gutting the department. Most key posts and many crucial ambassadorships remain vacant. 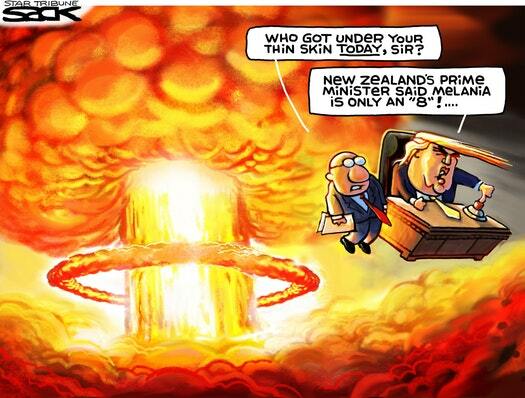 Image via The Bob Cesca Show Blog. I remember sitting on the side porch in the 1950s and feeling relief that, in the event of World War III, we were within the radius of the nuclear attack that would most certainly be delivered to Norfolk Naval Base, so I would not be around for the aftermath. If Trump wins, I can comfort myself with that same thought. Jim Wright hears the war drums. Here’s a bit; follow the link for the rest. We’ve got to do something. We’ve got to kill some people, man! War, it’s always the answer. War, it’s what Jesus would do. That’s what The Decider would do! That’s what Reagan would do! War! War! War! Drs. Joel Howell and Sanjay Saint think that the phrase “boots on the ground” to mean persons in the military needs to be retired as demeaning and dehumanizing. I certainly do not think of Captain First Son, USA, as a “boot” (though there were times I was inclined to give him one). “Boots on the ground” refers to the wearers of those boots. And those wearers are actual human beings, brave men and women who risk their lives in service to their country abroad. Some will die there. Some will return home injured; many will receive care at VA facilities. These people have lives, friends, loved ones, and all too often dreams lost and hopes abandoned on account of what happened to them. “Boots on the ground” implicitly invites the reader to think not about the many individuals who serve, but instead to reduce those people to a single article of clothing, one that in its uniformity belies the many different types of people who wear those boots. I will give a dollar to a doughnut that most of those who so casually use the phrase “boots on the ground” have not served. They would send the children of others into harm’s way. Rick Steves is fed up with cable news; he suggests that television news now foments fear for funding. A snippet. The drek to information ratio of TV news, cable or not, is off the scale. The last time I watched a television news show was a couple of years ago when we had (I kid you not) a white Christmas. We watched local TV News reporters standing around shocked! shocked! I tell you, that below-freezing temperatures are cold and slippery streets lead to car crashes. At least their findings were factual. Jon Stewart takes on the hysterians. Below the fold in case it autoplays. Culled from a larger article about a veteran’s efforts to provide a means of therapy to other veterans by encouraging them to write about their experiences, here is the nasty truth that the mongers of war want you to ignore (emphasis added). More than 2 million Americans have deployed in the post-9/11 wars, and they’ve all come back with something. Besides physical wounds and full-blown post-traumatic stress disorder, there are subtler torments: “moral injury,” an affliction separate from PTSD that comes from experiences that transgress deeply held moral beliefs; the weird desire to go back to a place they hate, because now nothing else makes sense; the feeling of extreme isolation, because whereas before they lived among people they’d have died for, now they live among people who barely know there was a war; the nagging certainty that they’ll never feel as alive as they did over there, or as connected to others, and that nothing will ever feel as important. I encourage you to follow the link and read the rest. The mongers of war want you to think that war is a John Wayne movie. In the movies, though, unlike in wars, everyone gets up and goes home whole after the shooting stops. Old men lie. Young folks die. Joseph J. Ellis, professor of history at Williams College, spots a trend. When you study how the U.S. goes to war, there is a prevalent though not perfect pattern. The triggering event is often a sudden crisis that galvanizes popular opinion and becomes the immediate occasion for military intervention but subsequently is exposed as a misguided perception or outright fabrication. The Mexican War began when President Polk cited an attack on American troops in Texas – troops he had deliberately placed there to provoke Mexico. The Spanish American War began when President McKinley claimed that the battleship Maine had been blown up by Spanish saboteurs; subsequent investigations showed that the explosion originated inside the ship, probably due to an accidental fire in the munitions compartment. Read the rest to see how often this pattern has repeated. 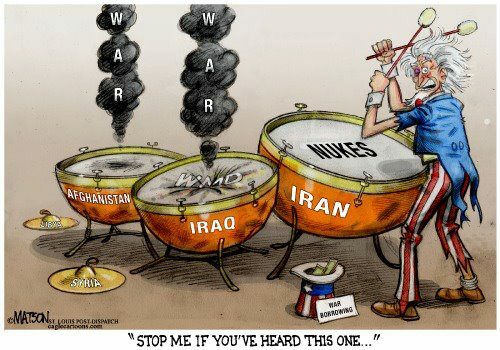 The next time you hear the war drums beating, be very skeptical.